The Mega-Truss Pick is CNC machined from solid 1″ × 6″ 6061 T-6 aluminum billet. Two pockets cut into the Mega-Truss Pick have coupler style aluminum pivoting links, half inch swivel bolts, and our solid wing nuts to completely wrap around the truss tube to secure it. 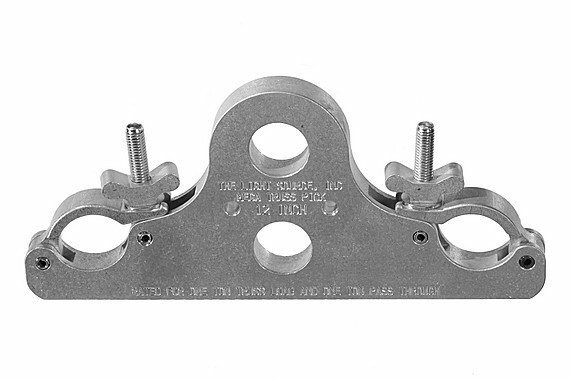 The Mega-Truss Pick has one top and one bottom rigging hole for attaching the truss to a shackle, motor, or chain hook. The Mega-Truss Pick will suspend up to one ton of truss load, plus an additional one ton load suspended under the truss. The Mega-Truss Pick weighs less than 4 pounds for the 12″ truss version. Fits 5/8″ Shackle and larger.